Struggling in a situation I was in, I've been wanting to read a book to console my restless soul. I do not like anything too preachy. I've opened books with interesting covers and titles, read a few pages but nothing felt right for me. I always find myself closing and putting it back on the shelf. A good friend of mine who manages OMF Literature, the store I was in, came to me and suggested Facing Your Giants by Max Lucado. Being a fan of the book and the author, she gave me an insight of what the book was about. I scanned through the pages and it quickly found its way into my soul. Facing Your Giants is about David and the giants he fought. You might ask, "why David?" Well... David has a very interesting life. He killed Goliath as a shepherd boy. He is bestfriends with the prince, Jonathan. He was subject to the king's rage. He was God's chosen to be king and became king. He lead armies to victory. He coveted Bathsheba. He had 8 wives. Throughout his life, David was faced with his "giants". 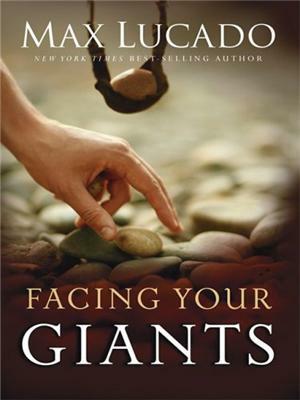 Each giant was captured in a chapter by Lucado. There were Raging Sauls, Desperate Days, Dry Season, Grief-Givers, Barbaric Behavior, Slump Guns, Plopping Points, Unspeakable Grief, Blind Intersections, Strongholds, Distant Deity, Tough Promises, Thin Air-ogance, Colossal Collapses, Family Matters, and Dashed Hopes. Lucado took each giant, detailed the character David was in, how he felt, what he did wrong, and how he lived it. David is us. David is me. The giants he faced are the same ones we are facing today - loss of a loved one, burnt out faith, stressful marriages, keeping promises, unanswered prayers, disappointments, and so many more. David was not perfect. He is not holy. Yet, God found favor in him. He was used despite his flaws and disobedience. We are far from perfect and far from deserving of God's attention. Yet by His grace, we are favored because we are loved. We are being used to show His victory. This book has a lot of meat. It is easy to read depite it being full of wisdom. Whatever you are facing, I'll bet you David experienced a version of it at some point in his life. To appreciate it more, read one chapter a day before going to sleep. Learn from David. I love the book so much that I even bought a good friend her own copy. When you find a book so good that it changes you, you pass it on. So, I pass this on to you.